Rocky McKinnon is at the forefront of the Stand-Up Paddle Boarding technique and progression in Southern California. Taught by some of the most elite watermen in the world, like Bonga Perkins, Rusty and Brian Keaulana, and Dave Parmenter, Rocky has the knowledge and experience to meet your training and performance goals with this fulfilling sport. Whether for training purposes or pushing the performance envelope, Stand Up Paddle Boarding will win you over! Rocky McKinnon is an accomplished and successful professional surfer and surfboard shaper based locally out of Huntington Beach. His experience and knowledge of surfboard design aids him to design state of the art Stand Up Paddle Boards that strategically maneuver in flat water as well as in the most challenging surf. Stand Up Paddle Boarding - What is it? 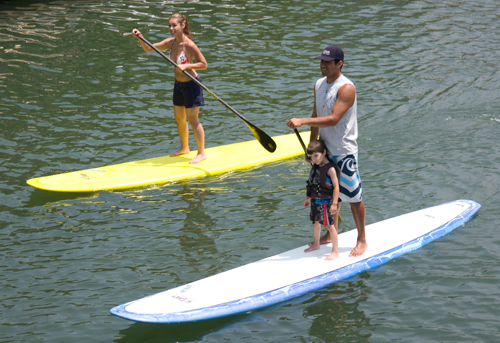 Stand Up Paddle Boarding is a water sport developed and originated in Hawaii. It involves paddling a large surfboard with an extended paddle to propel forward movement. 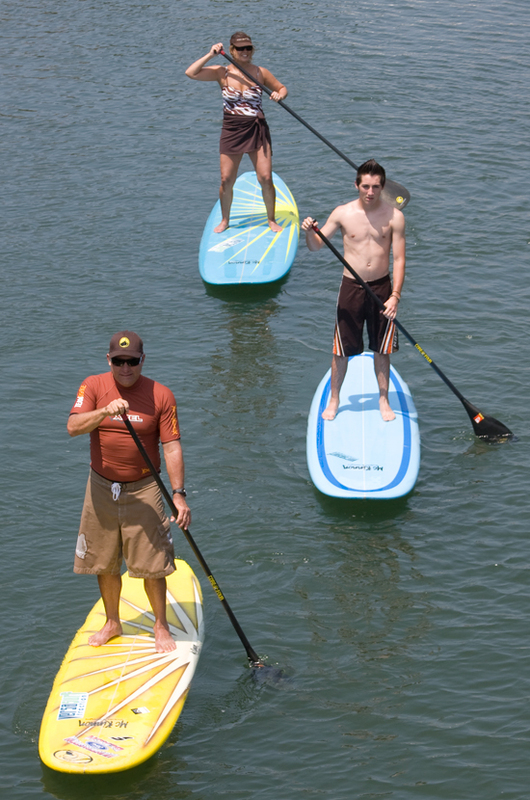 Stand Up Paddle Boarding has been described as a combination of paddling a canoe and surfing. The wider-longer board provides stability and flotation, while the paddle is primarily used for propulsion purposes, as well as maneuverability. And in many cases, the paddle provides additional stability. Stand Up Paddle Boarding is a unique style of exercising that is challenging, fun, and extremely rewarding. You can improve your balance, strength, and cardiovascular system with this exhilarating sport. In recent years, big wave surfers and elite watermen have resurrected Stand Up Paddle Boarding for cross-training purposes. This sport is a full body workout. The sport requires you to use your legs and abs for balance and your back, shoulders, chest, and abs for paddling. Between the paddling, standing, and surfing, Stand Up Paddle Boarding tones and shapes your body while providing strength training and overall muscle endurance. Furthermore, this complete body workout includes cardio-respiratory benefits. Stand Up Paddle Boarding lessons are geared and tailored for both the individual’s or group’s abilities. Each class will be introduced to proper technique and approach to the sport, exercises to strengthen balance and body, and will close with a short to medium distance paddle. Most lessons will be conducted in Huntington Beach and Newport Beach harbors, depending on what the lesson plan requires and/or at the request of the client. 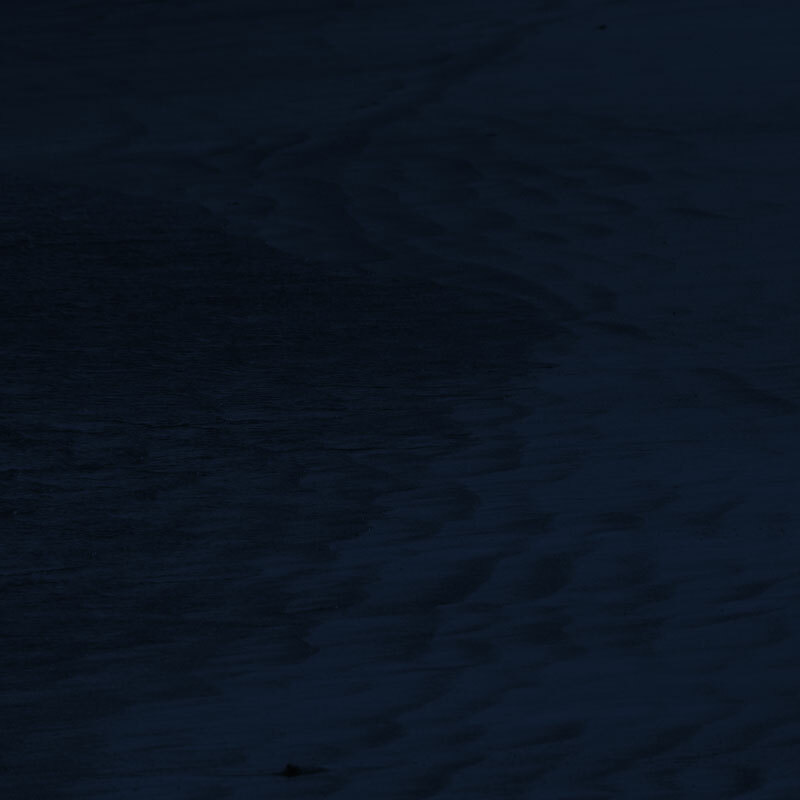 Advance lessons will be conducted at various Stand-Up Paddle Board friendly surf breaks depending upon conditions. Please call us directly at (714) 377-6101 or email us at rockymckinnon@mckinnonsurfboards.com. Include your personal information and any experience you may have, as well as the height and weight of each individual. Also provide time, date and location that best works for you.